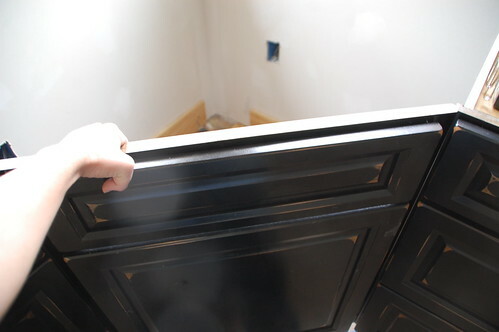 Making an impromptu decision to install the kitchen cabinets last weekend was one of the most fun and satisfying projects that has been tackled in this house for a long time. But of course there is always that one hurdle to overcome that takes longer than the rest of the project combined, and in the cabinet hanging adventure, that hurdle was the corner cabinet. The rest of the installation went smoothly, and not just because this once I lolled about and watched boys do the heavy lifting. Literally. Although technically because they were smart enough to install a wood board under the cabinet to rest it on, it wasn’t that heavy. After the wall cabinets were in, the base cabinets were a breeze. 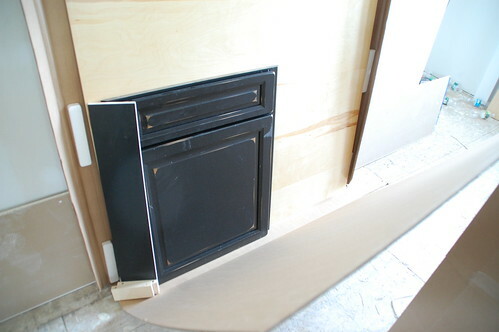 We put 1/2″ plywood “lifts” under the bottom cabinets so that once the floor is installed the appliances– dishwasher particularly– still fit under the counters. Alternatively you could put your floor down first, but why pay for hardwood under cabinets that no one will see? Much easier than holding them on the wall. These are the pieces that came for the sink base. The cabinet front, a toe kick, one bigass piece of plywood, and two mystery blocked. There was a lot of head scratching at this point as I tried to determine how exactly this was supposed to be assembled. 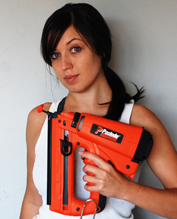 Did I need to build a plywood frame? Attach the cabinet face directly to the cabinets next to it? Why on earth is that piece of plywood so large? And what the hell are these little blocks for? I gave up at this point, and even after a few fruitless hours searching on the internet I couldn’t find any clear instructions on what Kraftmaid expected me to do with these pieces. There was nothing in the manual, nothing on the website, and apparently not one other person who has ever used a computer has needed instructions on this. After sleeping on it I decided some new research methods were needed. In my Mothers condo she has a large corner sink base that I am intimately acquainted with after spending an evening installing her new disposal. Not that I trust anything that the people who built her condo did, but regardless, after some investigation (which included making my mom crawl under her sink with a flashlight at 8 AM) I determined that the plywood was meant for the bottom of the sink base only, that the face was to be connected directly to the adjoining cabinets, and that the back sides should be left open to the drywall. Still no idea what those little blocks with the predrilled holes were for, but I decided to get started anyway. This meant a lot of finagling to install the second cabinet adjacent to the corner, so that both “sides” of the corner base were in place. 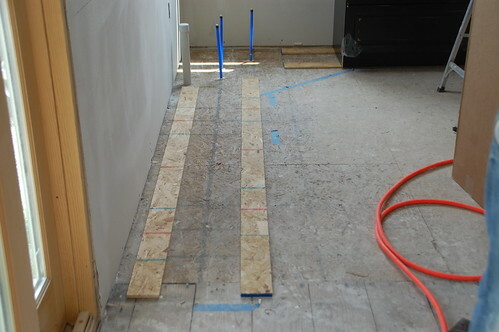 Then I cut some scrap plywood (4 pieces total) and ripped it down to the exact height of the toe kick. The objective was to make braces for the bottom piece of plywood to sit on. 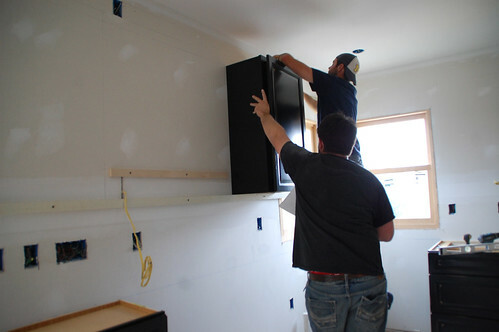 These were installed with drywall screws to the studs on the back walls, and the cabinets (being careful to install the screws low) next to the sink base. 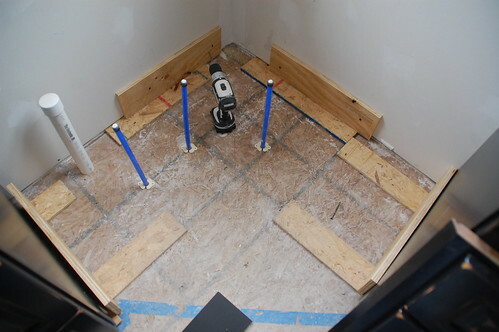 The plywood base was cut to fit along with trimming 45-degree angles off of the ends of the toe-kick so it would sit nicely against the side cabinets. Unfortunately my first thought was to attach it on the outside of the cabinets, which was completely wrong, so my miters ended up being the wrong way. Luckily I could just install the piece backwards since the toe-kick veneer will cover it. After the base was in, holding the face in place while it was predrilled and attached to the side cabinets was definitely a two-person job. It just took a little patience though, and I was left with this. 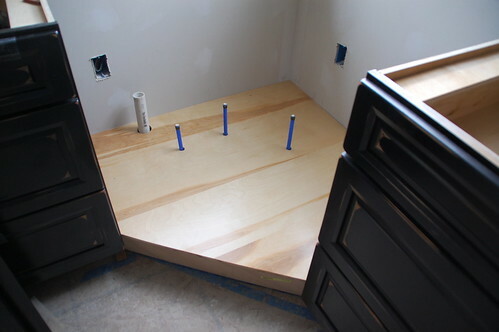 You’ll notice I also installed two pieces of scrap plywood level with the backs of the other cabinets so that our counter will have something to rest on. You may also notice that I did not use these two mystery pieces. And I gotta tell you, I don’t think it would have been nearly so hard to figure out how to do this if I wasn’t worrying about what I was obviously doing wrong because I wasn’t using these. Clearly I got over it, but still. I’m perfectly confident that what I did will work, but I’m curious if any one else in the universe has done this a different or “right” way. I think I know what the decoy pieces are for, but only after reading your whole post and seeing what you did and then looking at them again…. I think you could attach them at the base of the side 2 cabinets so that you could then attach the toe kick to them and rest the plywood on top of them since they appear to be toekick height. It’s a good thought G. Several times I was like “Ah-ha! Those must be for [fill in the blank]!” But those dang pieces are about 3/4″ longer than the width of the toe kick, and those pre-drilled holes would prevent you from cutting any of it off. The only thing I can think is that it did say in the installation manual that blind corner cabinets come with 3″ spacers. 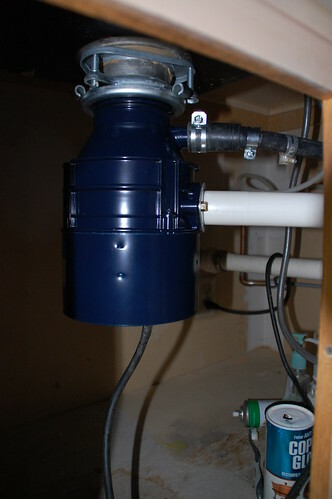 Although these were 2.5″, the sink base is not technically a blind corner, and they weren’t needed. But that’s the best idea I’ve got. Our corner sink cabinet is a homemade job (circa 1930 or so) but it essentially looks the same as yours – plywood base, cabinet front attached to the adjacent cabinets, open to the drywall at the back, wood brackets at the back to support counter. Seeing as how ours has lasted all these years, I bet yours will too. It’s looking great! I have a very similar setup to this and am curious. How did you run your water and drain lines for your dishwasher? Thank you for sharing this with the community. I am not sure what the mystery pieces are for but I used them to hold the toe-kick. I placed the toe kick in place prior to installing the base of course, then I placed the mystery pieces behind the toe-kick and screwed them onto the floor through the pre-drilled holes while flushed against the back of the toe-kick. I then removed the toe-kick and continued with installing the base. After I installed the base, I installed the toe-kick and drilled it to the mystery pieces. I am pretty sure that NOT I, but my genius and a true McGyver figured out what the mystery peices are. Get this. 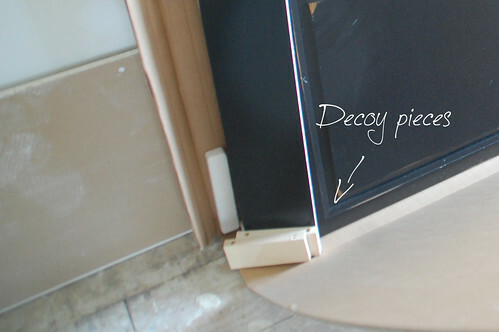 Should you have needed a spacer – meaning a gap between either the left or right cabinet box. Why 3 water lines ?? This is an older post, so I hope you see it. 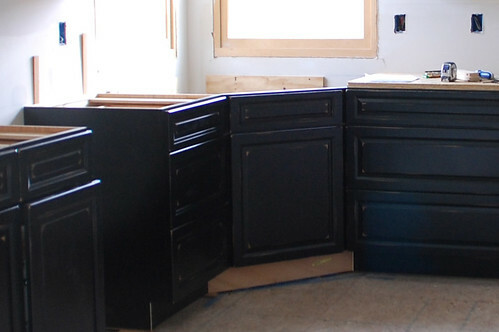 can you tell me where you purchased your cabinets – love them. I need a similar setup with a corner sink base cabinet. 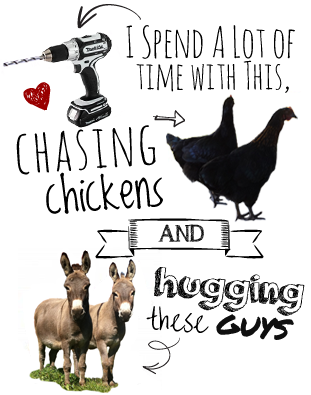 It’s funny how many times your blog comes up when I am looking for DIY info. I was looking for “how to build a cabinet corner sink base” and it brought me here. Great post and info! My husband and I just had our cabinets delivered and thought we were going crazy! Why on earth is there just a door/faceplate and a shelf?! 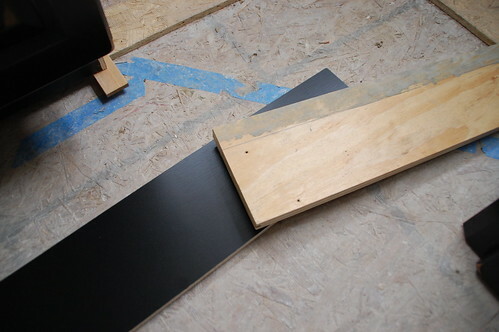 (our company provided us with a pre-cut shelf rather than a piece of plywood…i think I would prefer the plywood). We thought we had been “had” ….looking up corner sink cabinet assembly brought me here. At least I have a better idea of what is going on now! Thank you! This post was incredibly helpful! Can you confirm that your cabinets aren’t a full overlay? Ours are, so I think we’re going to need to add spacers on each side for the door clearance. If you go the Ikea cabinet route, you can use this corner sink “hack” that I put together. Click the link or go to this URL to download the PDF document. how did you support the countertop and the sink in the corner? I can imagine that must be a lot of weight there when the sink is full of water. I’m curious how you supported that!